I picked up an AKG Perception 220 a couple of years ago and I am quite happy with it. If I recall the price was about $170. Downside of it is that it is a condenser mic, which is not the easiest thing to hook up to a PC. I started out with a phantom power unit (Another 30 bucks or so) for it and tried to plug it directly into my sound card. I actually did have this working at one point but when I dusted it off to start my Heroes narration I could not get it to work again. I ended up getting a Scarlet 2i2 USB interface device (an additional $140 but well worth it in my opinion) and that solved all my issues with that and has built in phantom power along with other minor features. So there's always a lot of discussion on WHAT kind of mic you should use (Condenser vs. Dynamic) and everybody seems to have their own opinion on which is best. A lot of it boils down to cost as well. 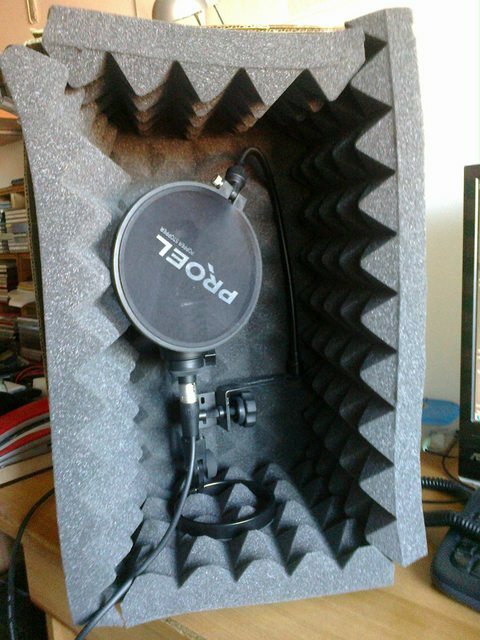 The 170 bucks I paid for my AKG is LOW end price (There are cheaper ones but, as the saying goes, you get what you pay for generally holds true) but the price can range into the thousands for a real high end mic. Plus the price I paid is not counting the other stuff I had to get to make it work right. Dynamics generally do not need external power either and quality between the two for narration work seems almost moot but I would need someone with more experience with them to really comment. There are some good low ends of both variants that are not too hard a hit on the wallet and it's hard to go wrong, really, if you do a little research. What you really do NOT want is just some cheap 10 dollar boom mic or headset mic. I could point out some obvious examples of this but you know it when you hear it. There's nothing more irritating than listening to a narration that has a horrible background hum or had poor range. Personally, I'm of the opinion, if you're going to try and narrate Fics, especially the more well known/done ones then you OWE it to the author and the work to put the effort and money into a proper setup before you start. I've had good luck with my Blue Spark and tube mic preamp. That plus the Line 6 UX1 is a $400 setup though. That's about what my setup cost in the end. I'm debating getting a higher end pre-amp with more options. My biggest issue is having to clean up audio after recording......what I really need is a mouse with not 'click', lol. I spend an inordinate amount of time removing mouse clicks. That's more an issue of mic sensitivity and a loud mouse. I use a midi keyboard that has a record button control, and Protools/Reaper has a 1-2 second delay from start of recording. It helps, but I manually trim down takes anyway. I'll also read one paragraph at a time to avoid scrolling. Well, my clicks come from the stop of recording..and I guess it's loud...but..no more so than a normal mouse.but I'll figure something out...it's not too bad when the chapter is only an hour but I when I do these nearly 2 hour 20k word chapters its becoming more annoying. I'll have to try Reaper out. I mostly use Audition but always on the look out for something that can improve the work flow. If they are at the end of the recording, give yourself a second or two pause, stop the track, and drag the clip's border to the end of the last waveform (the part where you ended the last word). It'll soft-delete the audio, and takes less than a second to do at the end of a recording. Edit: In REAPER. Audition and others are a bit more involved. Well, I should state that I do a lot of start and stops. Plenty flubbing lines or doing retakes of certain bits. Typically I just start recording after the last word...but clicks still make their way in. Actually..now that I think on it...some of those clicks have to be from the start of recording too...not sure how that can be though. I started out with a Samson C01U, which is a cheap (~€75) USB condenser mic that almost everyone you ask will tell you is the ideal for beginners. It has a rather narrow dynamic range, though, so eventually I sold that out on Ebay and bought an Audio Technica 2020 (~€90) with a Behringer MIC100 preamplifier (~€30). They're both very good quality mics and I'm enjoying very much the AT and the ability to tweak the preampli's gain and output knobs on the fly as I record: that allows me to, say, narrate, scream and then keep on narrating without having to stop or do retakes because I clipped. Only complaint about the AT is that it's very sensible to pops, so you've got to be a bit careful about that. Everything is fed via jack to my PC soundcard (an old cheap Sound Blaster Audigy SE, but it gets the job more than egregiously done). When I record or check for retakes I keep earphones on, but I've got my good ole trusty Sennheiser HD 380 Pro headphones for editing. I should also mention that I ended up swapping the vacuum tube in the MIC100 with an Electro Harmonix (~€15), because The Internet™ had told me it would do good. I didn't notice that much of a difference, though. Maybe a tad bit less white noise. And by the way, guys, I don't think you can expect to not pick up any clicks or background noises at all, some are always going to get through. Downside of having good equipment, heh. Wow... and Audigy...that's going back a ways :) I tried using my PC card with a phantom power supply..but I had a devil of a time getting it to work in windows. Had it working at one point..then later could not get it to work for the life of me. The Focusrite Scarlet 2i2 took care of all that but it's very no frills and I want to upgrade to something with more options like you're talking about Aaanok. I need a better pair of monitor headphones too...using ones that were meant for when playing drums..with small drivers in them. Works great, but for 40 bucks the drivers are not the best, obviously. I use an Audio Technica 2035 with a Presonus one tube pre-amp. Gives a nice warm sound, I think. 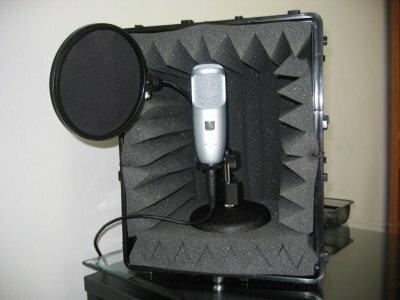 I was amazed at the difference when I went from a dynamic mic to the phantom condenser. Not really in sound quality so much, though there was some improvement in that, but the output gain from the powered mic allowed me to turn down the gain on the pre-amp which eliminated nearly all the hiss. I used to run a hiss removal tool in post-production but I don't have to do that now. Yeah, I need to try that...been doing that all wrong using a higher gain and fighting with noise removal afterwards. Looks terrible but works amazingly well. I originally intended to glue velcro to the cardboard box and foam, but I eventually found out that it isn't really necessary. Back foam panel still is velcro'ed to the box, though. To dredge up an old topic, I just picked up Shure sm7b Dynamic Mic, supposedly the legendary work horse of the VO world. I've not had a LOT of time to us it yet but so far so good. I honestly can't tell much between the quality of it and the AKG. I'm going to do some side by side tests this coming week to see if there is any measurable difference in off axis sound, which is what I really got it for. With the AKG I have to silence everything in the house...turn off the AC, shut off the NAS unit, ceiling fan etc. and it would be nice not have to do that.